The Rule of Engagement · Sherwood Smith · na Lace and Blade, ed. Deborah J. Ross, Leda 2008; ebook exclusive. Echopraxia · Peter Watts · ex Tor 2014; ebook exclusive. Clockwork Secrets: Heavy Fire · Dru Pagliassotti · ex Hades Publications 2014; ebook exclusive. Giliad · Gregory Feeley · na The First Heroes: New Tales of the Bronze Age, ed. Harry Turtledove & Noreen Doyle, Tor 2004; ebook exclusive. The Brothers Cabal [Johannes Cabal] · Jonathan L. Howard · ex Thomas Dunne Books 2014; ebook exclusive. The Necromancer Candle · Randy McCharles · ex Hades Publications 2014; ebook exclusive. The Puzzle · Zoran ivković; translated by Alice Copple-Toić & Christopher Gilmore · ss Seven Touches of Music, Ministry of Whimsy Press/Polaris 2001; translated from the Serbian. 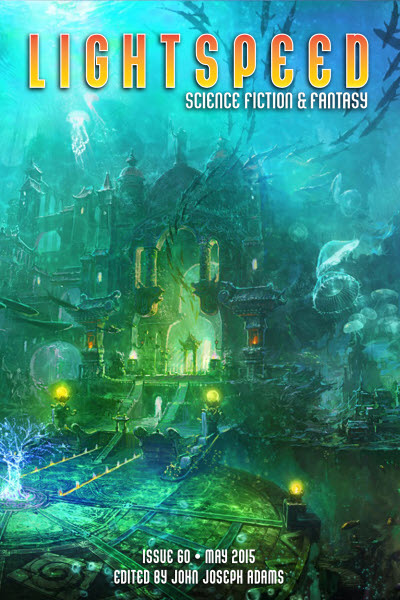 Jesus and the Eightfold Path · Lavie Tidhar · ss Immersion Press 2011; ebook exclusive. Once More, for Old Times Sake · Carrie Vaughn · ss Wild Cards: Lowball, ed. George R. R. Martin & Melinda Snodgrass, Gollancz 2014; ebook exclusive. The Doubt Factory · Paolo Bacigalupi · ex Little, Brown 2014; ebook exclusive. 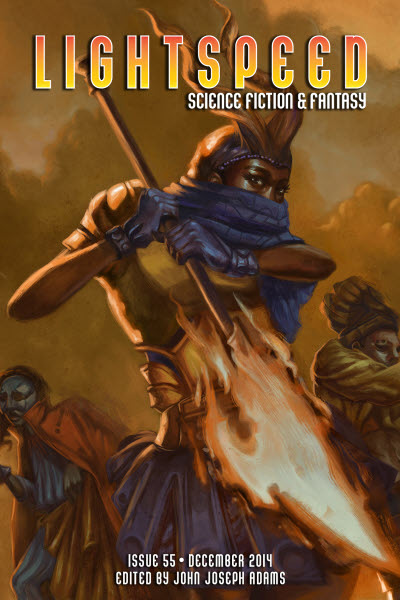 Ancillary Sword · Ann Leckie · ex Orbit 2014; ebook exclusive. 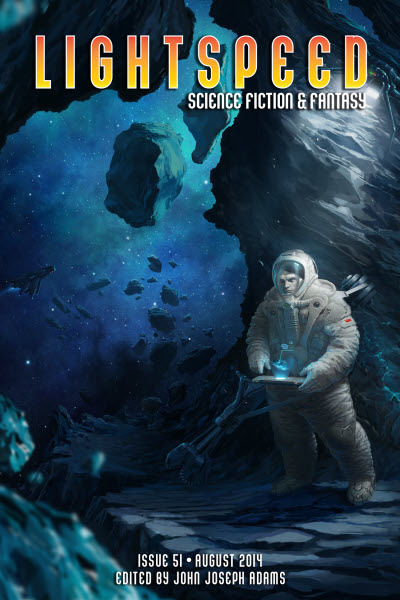 New Light on the Drake Equation · Ian R. MacLeod · na Sci Fiction May 2 2001; ebook exclusive. 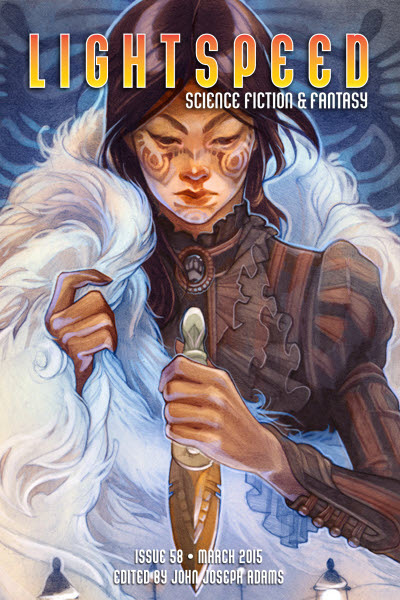 Symbiont [Parasitology] · Mira Grant · ex Orbit 2014; ebook exclusive. The Three-Body Problem · Liu Cixin · ex Tor 2014; ebook exclusive. Soul Case · Nalo Hopkinson · ex Foundation Sum 2007; from the forthcoming novel Blackheart Man. The Girlhood of Shakespeares Heroines · John Crowley · na Conjunctions #39 2002; ebook exclusive. Undercity [Skolian Empire] · Catherine Asaro · ex Baen 2014; ebook exclusive. The Genome · Sergei Lukyanenko · ex Open Road Media 2014; ebook exclusive. 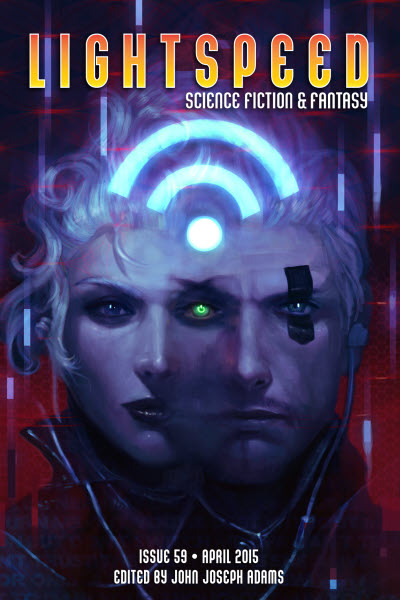 The Choice [Jackaroo] · Paul McAuley · na Asimovs Science Fiction Feb 2011; ebook exclusive. A Darker Shade of Magic · V. E. Schwab · ex; ebook exclusive. ; forthcoming from Tor in February 2015. The Galaxy Game · Karen Lord · ex Del Rey 2015; ebook exclusive. In the House of Aryaman, a Lonely Signal Burns · Elizabeth Bear · na Asimovs Science Fiction Jan 2012; ebook exclusive. Karen Memory · Elizabeth Bear · ex Tor 2015; ebook exclusive. Gemini Cell [Shadow Ops] · Myke Cole · ex Ace 2015; ebook exclusive. 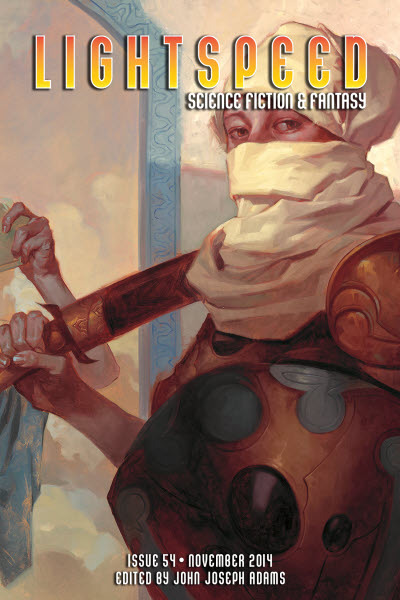 The Weight of the Sunrise · Vylar Kaftan · na Asimovs Science Fiction Feb 2013; ebook exclusive. Persona · Genevieve Valentine · ex Saga Press 2015; ebook exclusive. Harrison Squared · Daryl Gregory · ex Tor 2015; ebook exclusive. On the Dying Winds of the Old Year and the Birthing Winds of the New · Kate Elliott · na Very Best of Kate Elliott, Tachyon Publications 2015; ebook exclusive. Lieutenant Arkham: Elves and Bullets · Alessio Lanterna · ex Acheron Books 2014; ebook exclusive. The Grace of Kings [Dandelion Dynasty] · Ken Liu · ex Saga Press 2015; ebook exclusive. 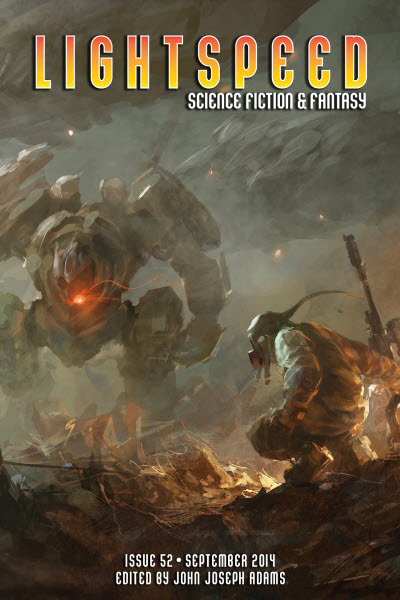 The Rebirths of Tao [Tao] · Wesley Chu · ex Angry Robot 2015; ebook exclusive. The Mill · Paul Di Filippo · na Amazing Stories Oct 1991; ebook exclusive. Magonia · Maria Dahvana Headley · ex HarperCollins 2015; ebook exclusive. 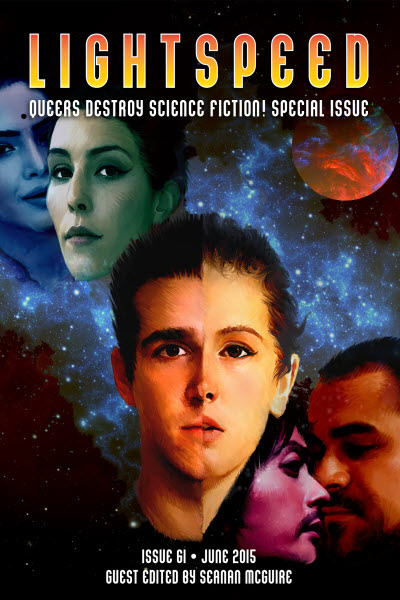 Special super-sized Queers Destroy Science Fiction! issue funded by a Kickstarter campaign. The contents listed are for the trade paperback edition - only a subset of the contents appeared as the regular online issue. Details taken from Table of Contents. 28 · Trickier with Each Translation · Bonnie Jo Stufflebeam · ss; not in online edition. 57 · The Tip of the Tongue · Felicia Davin · ss; not in online edition. 70 · How to Remember to Forget to Remember the Old War · Rose Lemberg · ss; not in online edition. 77 · Plant Children · Jessica Yang · ss; not in online edition. 111 · Two by Two · Tim Susman · ss; not in online edition. 125 · Die, Sophie, Die · Susan Jane Bigelow · ss; not in online edition. 154 · Mama · Eliza Gauger · vi; not in online edition. 159 · Deep/Dark Space · Gabrielle Friesen · vi; not in online edition. 160 · A Brief History of Whaling with Remarks Upon Ancient Practices · Gabby Reed · ss; not in online edition. 164 · Nothing Goes to Waste · Shannon Peavey · vi; not in online edition. 167 · In the Dawns Between Hours · Sarah Pinsker · vi; not in online edition. 170 · Increasing Police Visibility · Bogi Takács · ss; not in online edition. 174 · Letter from an Artist to a Thousand Future Versions of Her Wife · J. Y. Yang · vi; not in online edition. 195 · Cyberfruit Swamp · Raven Kaldera · ss Genderflex, ed. Cecilia Tan, Circlet Press 1996; not in online edition. 206 · The Sound of His Wings · Rand B. Lee · nv Isaac Asimovs Science Fiction Magazine Aug 1982; not in online edition. 228 · O Happy Day! · Geoff Ryman · nv Interzone: The 1st Anthology, ed. John Clute, Colin Greenland & David Pringle, Everyman 1985; not in online edition. 258 · Something to Hitch Meat To · Nalo Hopkinson · nv Skin Folk, Warner Aspect 2001; not in online edition. 268 · Author Spotlight: Bonnie Jo Stufflebeam · Jill Seidenstein · iv; not in online edition. 275 · Author Spotlight: Felicia Davin · Robyn Lupo · iv; not in online edition. 277 · Author Spotlight: Rose Lemberg · Sandra Odell · iv; not in online edition. 281 · Author Spotlight: Jessica Yang · Arley Sorg · iv; not in online edition. 289 · Author Spotlight: Tim Susman · Rahul Kanakia · iv; not in online edition. 292 · Author Spotlight: Susan Jane Bigelow · Jill Seidenstein · iv; not in online edition. 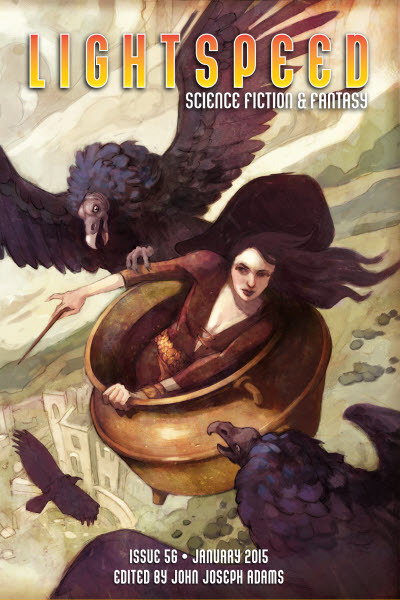 298 · Author Spotlight: Raven Kaldera · Sandra Odell · iv; not in online edition. 301 · Author Spotlight: Rand B. Lee · Arley Sorg · iv; not in online edition. 303 · Author Spotlight: Geoff Ryman · Robyn Lupo · iv; not in online edition. 306 · Artist Gallery · C. Bedford · il; not in online edition. 307 · Artist Gallery · Odera Igbokwe · il; not in online edition. 308 · Artist Gallery · Orion Zangara · il; not in online edition. 309 · Artist Gallery · Isabel Collier · il; not in online edition. 310 · Artist Gallery · Paige Braddock · il; not in online edition. 330 · Weve Made It to...Magrathea? 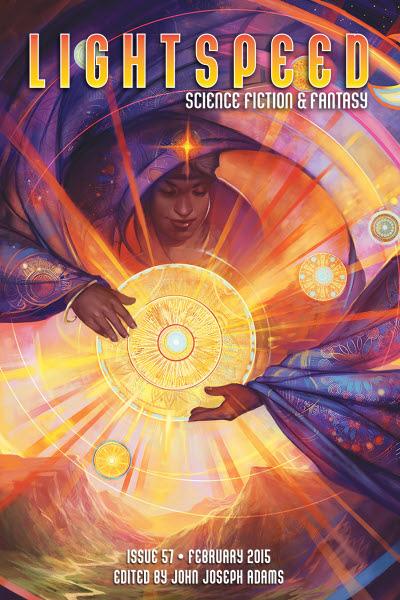 : Why We As QTPOC Need to Hack Science Fictions Improbability Drive · Jennifer Cross · ar; not in online edition. 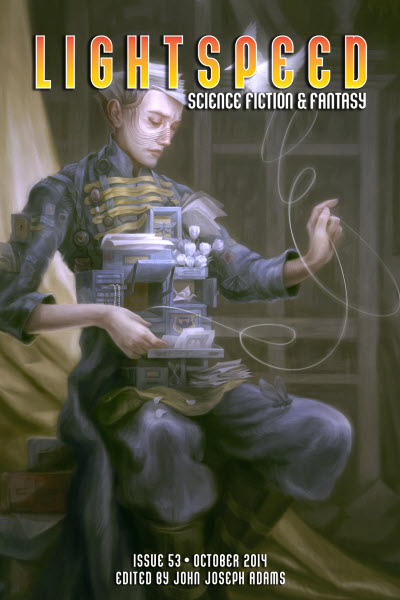 334 · Not Android, Not Alien, Not Accident: Asexual and Agender in Science Fiction · Cedar Rae Duke · ar; not in online edition. 339 · Diversity in a Ghetto: The Marginalization of Modern Activism in Traditional Fandom · Pablo Miguel Alberto Vazquez · ar; not in online edition. Personal Essays; not in online edition.